It would be very churlish of me I think to ignore the flight career of the Zinzan crew before Bob’s arrival. Completing his first ‘2nd dickie’ flight with the Flight Lieutenant W. Wakelin’s crew to Osterfeld on the 11th of December 1944. The following day the new crew would receive a somewhat harsh baptism with their first raid on Witten. Peter got back to me almost straight away. 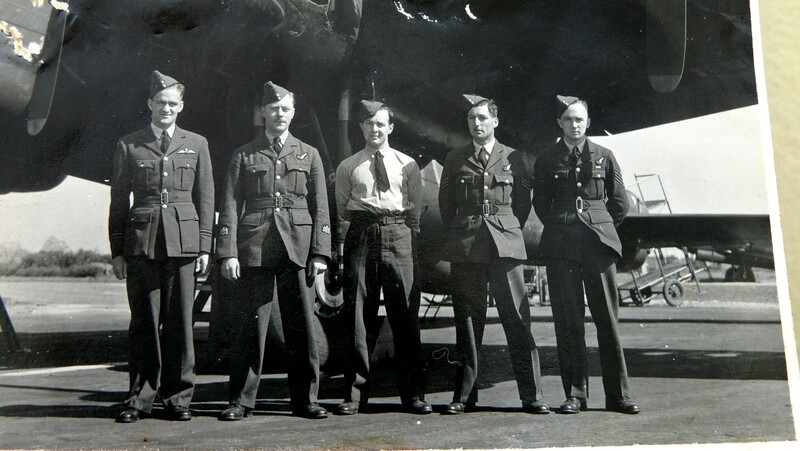 Sadly, but perhaps inevitably, he, like me, new nothing about his fathers wartime career, but magically, he attached an image of his father, Vernon, and 4 of his crew. Initially, I was stumped as to how I was going to try to identify the others in the photograph. Compiling the running crew rosta from the ORB let me quickly see that the Navigator, J. Coote (later to be fully identified as James Sydney George Coote) was the only Warrant Officer in the crew. Realising this ‘obvious’ fact allowed me to then identify him in the photograph based on his insignia on his uniform, as opposed to the Sergeants stripes of the other 3 unknown aircrew. The chap on the far right is Sgt. W/O Miles Parr, I have the same picture with me now. I am utterly blown away with this information – I’ve replied to the email you sent me.